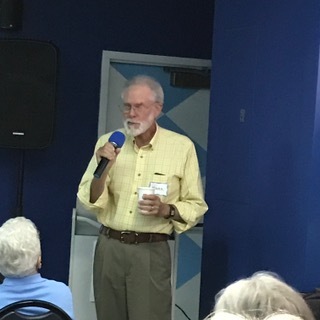 Makes presentations to local civic clubs, colleges, community organizations and residential groups, educating the public on state and local issues. Training and materials are provided. The Speakers Bureau offers presentations on The Electoral College; Restore the Vote Your Florida Government, Your County Government, Constitution Revision Commission and Gun Safety. The 2018 November Ballot Proposals November 6, 2018 is Election Day across the country. Florida ballots will contain at least 13 proposed amendments to the Florida Constitution as well as county referendums. The proposed Constitutional amendments and county referendums will affect Florida residents on both personal and public levels. They range from proposals about offshore drilling, voting rights for felons who’ve completed their sentences and term limits for district school board members to abolishing local control of charter schools and more. Too often such amendments are written in confusing language, and a very large percentage of Floridians never vote on all of them. The 2018 proposed amendments will likely result in a similar situation: confusion and a resultant low voter turnout. This one-time presentation will provide a detailed explanation of each of the proposed amendments, affording attendees an opportunity to understand exactly what they are voting for or against. The PowerPoint and speaker will encourage discussion. Attendees will receive a handout describing all proposed amendments and capsulizing the content of the lecture. This presentation is being offered during the months of September and October, only. Call early to schedule a speaker for this one. Our bookings for the Ballot Proposals presentation are filling up quickly. This is being presentation is being offered as Palm Beach County declares a housing crisis to be their top priority. Our county's economic success, family stability, and quality of life are dependent on all residents having adequate housing. While this may be obvious, the reality is that there is a serious housing problem in our county. This presentation offers a perspective on what constitutes affordable housing: what is the county’s housing problem and who is affected by it. We describe the impediments and discuss some solutions. The Constitution of the United States divides the federal government into three branches to ensure a central government in which no individual or group gains too much control. This presentation describes the powers of the Legislative, Executive and Judicial branches of the federal government and how they relate to one another. Florida is one of only 4 states that permanently disenfranchise every citizen who is convicted of a felony. This presentation examines why more than 10% of Florida’s voting age population cannot vote and explains the Florida 2018 ballot proposal to automatically restore voting rights to most citizens after they fulfill all of the terms of their sentences. The promise of charters was to permit charter schools that offered innovative methods or provided courses that were not provided by the public school system. Have charters fulfilled their promise? This presentation explains the origin and function of the Electoral College and what some states are doing to change how we elect the President and Vice President of the United States to reflect the popular vote. Private schools in Florida are funded directly by the legislature through vouchers for students with disabilities and indirectly through corporate tax credit rebates scholarships. This presentation explains how the operation and regulation of the Florida Tax Credit Scholarship program differs from public school programs. What is fracking? This presentation explains fracking, the status of fracking in Florida and the effects of fracking of our environment. This presentation reviews Florida’s current gun laws and legislative proposals in the search to balance, as nearly as possible, individual constitutional rights with the welfare of the community. What do Medicare (Parts A, B, C, and/or D), Medicaid, and other health insurance options mean for me? How do I make the right choice when it comes to my healthcare and my vote on healthcare issues? This presentation explains how the American healthcare system works, demystifies some of its vocabulary, and looks at what Americans get for their healthcare dollar compared to other countries. Pollution should be prevented or reduced at the source whenever feasible. The federal Resource Conservation and Recovery Act sets the order of preference for managing materials as: source reduction, reuse, recycling, and disposal. A number of communities are initiating bans of plastic bags that are intended for single use, such as those commonly provided in grocery stores. This presentation looks at what is happening in Florida. The League of Women Voters supports juvenile justice actions that emphasize civil citations, rehabilitation, and other alternatives to incarceration. Our mission is to improve outcomes for at-risk youth in Florida. The League believes that preventative measures are effective in helping at-risk kids reach their full potential. This slide presentation shows the positive effects of implementing civil citations in our communities. Your Voice. Your Power. Your Vote! In 1776, only 10% of Americans had the right to vote. Learn about how voting rights were expanded and the important benefits for citizens who turn out and vote. This presentation also walks you through the ways you can register and vote, including how to register online, Vote-By-Mail, Early Voting and more.